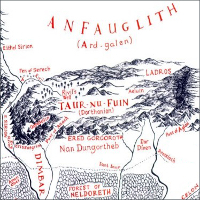 Dorthonion (Taur-nu-Fuin) and the surrounding lands. [Into the Bay of Balar] the mighty river Sirion flowed down from the new-raised highlands northwards: Dorthonion, and the mountains about Hithlum. [Ungoliant] abode long time under the shadow of the precipices in which Dorthonion fell southward. And they became known as Ered Gorgoroth, the Mountains of Terror, and none dared go thither, or pass nigh them; there life and light were strangled, and there all waters were poisoned. East of Dorthonion the marches of Beleriand were most open to attack, and only hills of no great height guarded the vale of Gelion from the north. 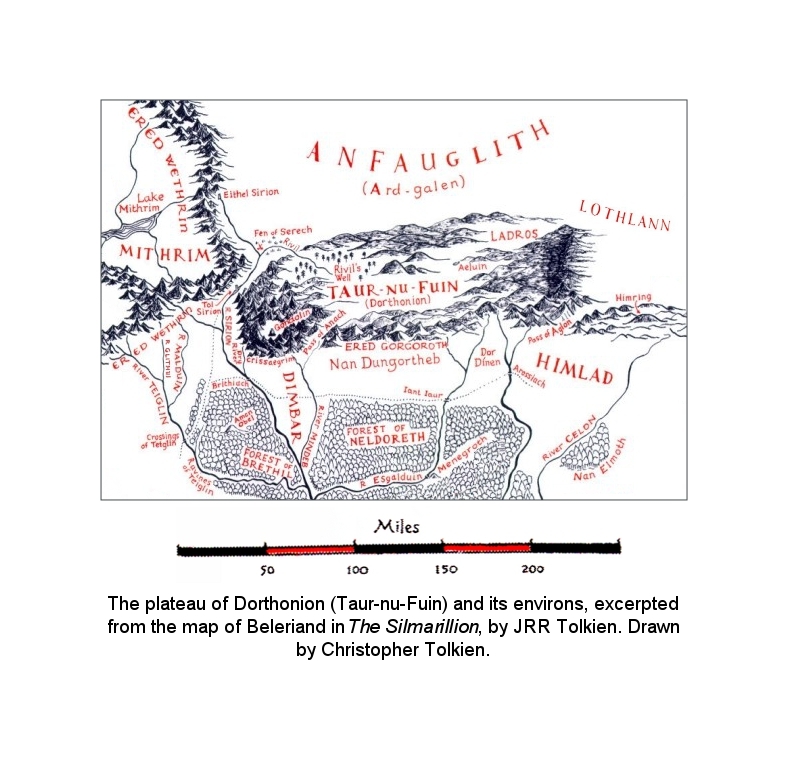 In that region, upon the March of Maedhros and in the lands behind, dwelt the sons of Fëanor with many people; and their riders passed often over the vast northern plain, Lothlann the wide and empty, east of Ard-galen, lest Morgoth should attempt any sortie towards East Beleriand. The chief citadel of Maedhros was upon the Hill of Himring, the Ever-cold; and that was wide-shouldered, bare of trees, and flat upon its summit, surrounded by many lesser hills. Between Himring and Dorthonion there was a pass, exceeding steep upon the west, and that was the Pass of Aglon, and was a gate unto Doriath; and a bitter wind blew ever through it from the north. But Celegorm and Curufin fortified Aglon and held it with great strength, and all the land of Himlad southward between the River Aros that rose in Dorthonion and his tributary Celon that came from Himring. Now the forest of Dorthonion rose southward into mountainous moors; and in the east of those highlands there lay a lake, Tarn Aeluin, with wild heaths about it, and all that land was pathless and untamed, for even in the days of the Long Peace none had dwelt there. ... Angrod and Aegnor... dwelt in regions whence Thangorodrim could be descried, and the threat of Morgoth was present to their thought. [In] Dorthonion the lordship of the people of Bëor and the country of Ladros was given to Boromir, son of Boron, who was the grandson of Bëor the Old.